While Cartagena is steamy hot during the day, late afternoons and evenings are wonderfully refreshing with cool ocean breezes. 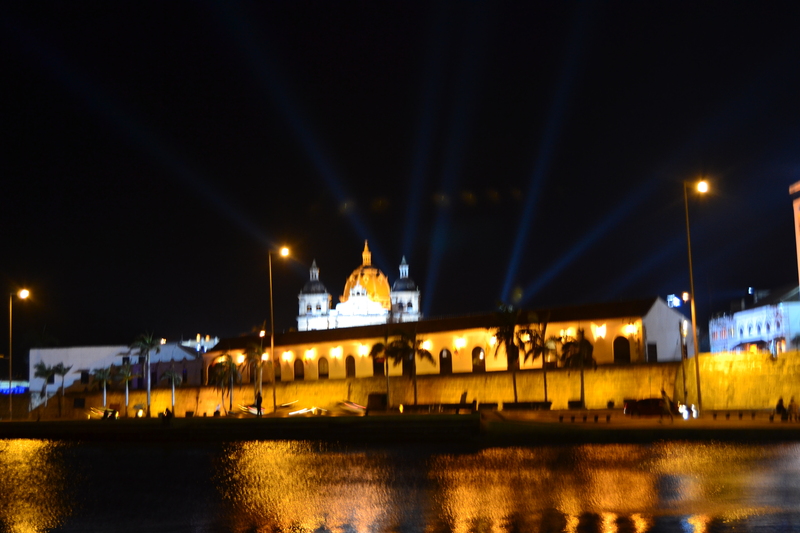 Outside the streets are lit with colorful lights, showing Cartagena in all it’s splendor. Even the stars and the moon attend the event. 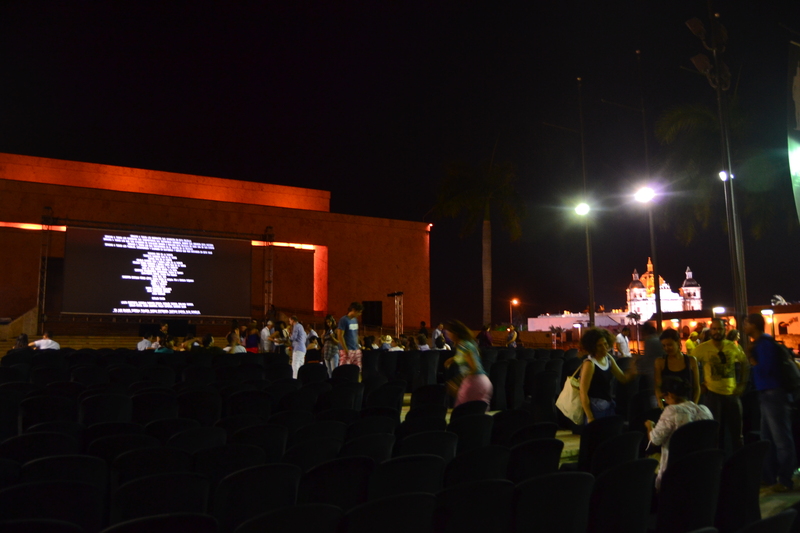 Actually, the festival offers films at multiple venues across Cartagena so residents can see films near their homes – but I prefer the chance to enjoy the city since the convention center is just outside the Historic quarter in the Gestamani area. The showings are free and open to the public, the venues are comfortable, spacious and while well-attended – much less crowded than I anticipated. All the hoopla, elitism and excesses of Hollywood are a million miles away. Instead of overpaid movie stars in ten-thousand-dollar designer dresses, segregated behind velvet ropes, the filmmakers themselves appear to speak directly to the audience as they introduce films. They encourage feedback and answer questions. The first film I saw was a documentary by a Colombian filmmaker named German Piffano. 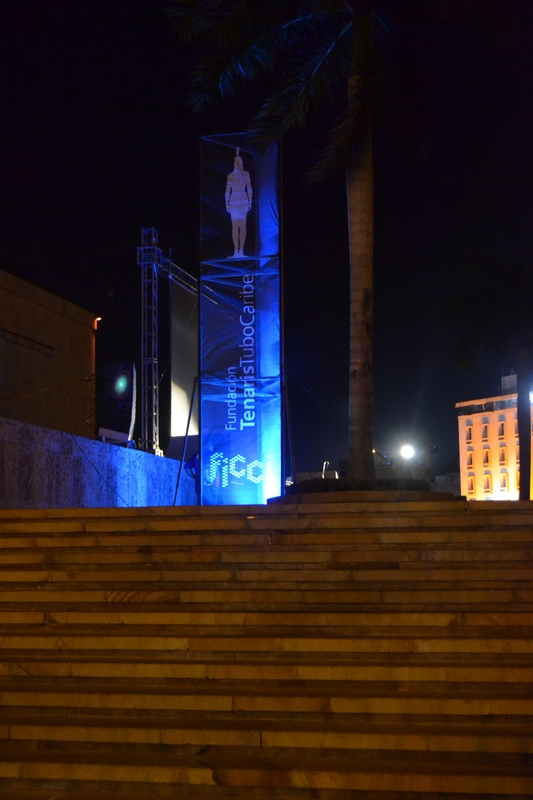 I kind of stumbled into the convention center as I was out enjoying the evening breeze, taking pictures. This documentary took fourteen years as the director follows the life of an addict. When we first encounter Jose, he is living in the alleys of El Cartucho and is addicted to crack. The film follows Jose Iglesia, a Spaniard, among the backdrop of the evictions and destruction of barrio El Cartucho (Santa Inez), as well as the course of his life over several years. We see the evolution of a charming, if filthy-appearing addict as he attempts recovery. It was certainly an interesting movie, particularly since it shows the underside of a life most of us only know of – not about. The undertones of the movie are rather sweet as Jose develops a bond with the filmmaker over the years but it’s not a “happy ending” kind of story (Colombian movies don’t often have Disney endings, I’ve found.) There is one heart wrenching scene as a twelve-year-old boy talks about how he came to live in El Cartucho after being introduced to crack. While the movie was probably about 30 minutes too long for my taste, overall, it was pretty good. While some of the camera shows are definitely artistic in nature (à la “in-your-face”) the documentary changes as Jose changes. There were points where I laughed at his antics (along with crowd) and other parts when I though, “Gee, what a shyster.. Is the director buying this?” Mainly, it was touching to see all the people who reached out to Jose to help him. We always hear how harsh and cruel the world is – but this movie (along with the second film) also showed how generous people can be even in the most dismal circumstances. The story of El Cartucho is pretty interesting in itself, and has been the basis of several Colombian documentaries. A clip of one of them can be seen here at YouTube. Recommended reading: Dreams of El Cartucho: Violence, Fear and Trust in a Bogota slum. Master’s thesis by Michael Soto. The second film was the film I came specifically to see. As I mentioned in a previous post, I was lucky enough to sit next to the director of this film on my flight to Cartagena. He told me a little about the film and that was enough to wet my appetite. I went because I was curious – it sounded good.. But it turned out it was wonderful in that way that leaves you empty. Set outside, the stars and historic buildings make a lovely backdrop.. I found this movie hard to watch at times. It wasn’t due to violence, gore or the other reasons we usually think it. At times, I had to cover my eyes because it hurt to see the hardship and suffering of the characters in the film. Despite that – I loved it. I admit I cried – but not because it was one of those tear-jerking tales that manipulates the viewer ala Steven Spielberg and the girl in the red coat in Schindler’s List. I cried because it wasn’t. But then – I am a philistine and tend to hate that sort of stuff. I don’t like when artists try to tell me how to feel, how to interpret and what to think.. and this film did none of this. Instead, it did what a good film should: it told a story. And like the majority of stories based on reality, there aren’t any dramatic rescues or miracles in the last five minutes of the film. There is also a scene where I felt shame – (a scene at the end when the characters have crossed into the United States). I felt shame because I think of the militias and the so-called “Minutemen” border patrols, and I know that some Americans would shoot / even kill illegal immigrants – and think of them as less than human. More significantly, I think it is a film more Americans should watch. I am lucky enough to travel, and to see different places in the world – and that has changed me. It’s impossible to live and study in Mexicali – next to the border fence and not change your perspectives; about immigration, and about humanity, compassion and seeing things (literally) from both sides of the fence. But too many people don’t have that opportunity and will never get to see the lives of many of the people they condemn for crossing the border to come to the United States. Enough of such serious subjects! 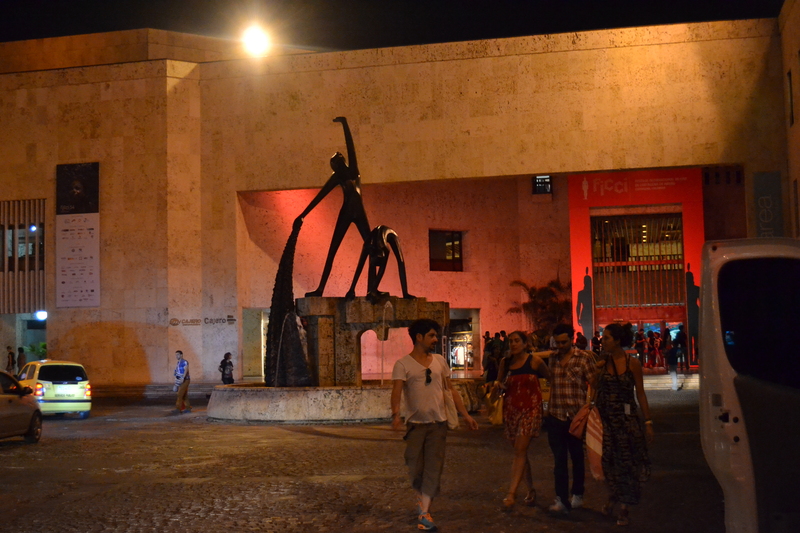 Tonight I am heading back to the festival for another round of films – and more photos of Cartagena for my readers. 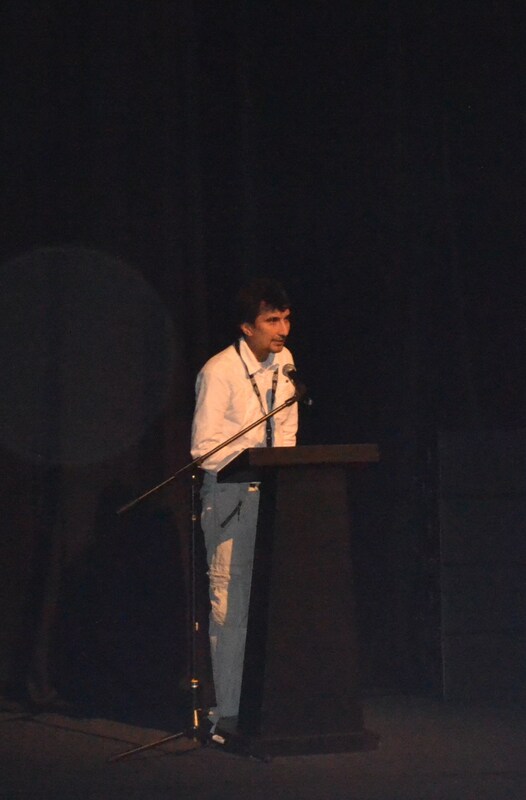 This entry was posted in Cartagena Life, Cuisine & Culture and tagged Cartagena 54th Festival Internacional de Cine de Cartagena, Colombian documentary, Colombian Film Festival, El Cartucho, human trafficking, illegal immigration, Infierno o Paraiso, La Jaula de Oro, March 2014, the human side of illegal immigration. Bookmark the permalink.